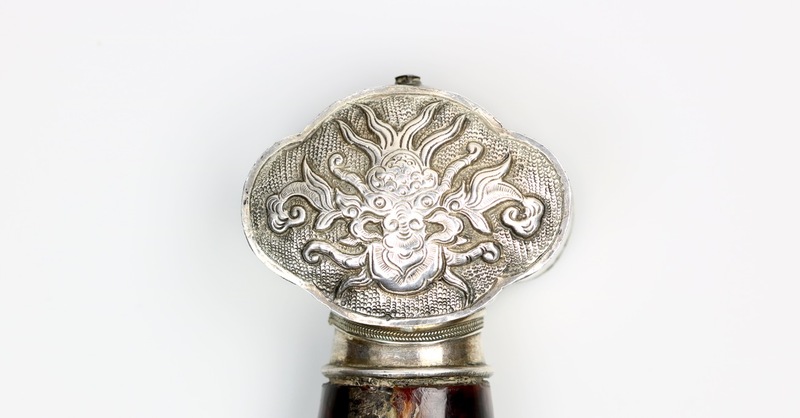 The Vietnamese kiem is closely related to the Chinese jian , a double edged straightsword that was worn by an elite class of scholar-officials. As such, kiem are one of the rarer sword types. Highly ornamental Vietnamese kiem such as this one were carried at official ceremonies held during the Nguyễn dynasty. Blade thickness: 6 mm at base, 4.5 mm middle, 3.5 mm at tip. Blade width: 24 mm at base, 22 mm middle, 16 mm at tip. A very good Vietnamese kiem of the Nguyen dynasty. 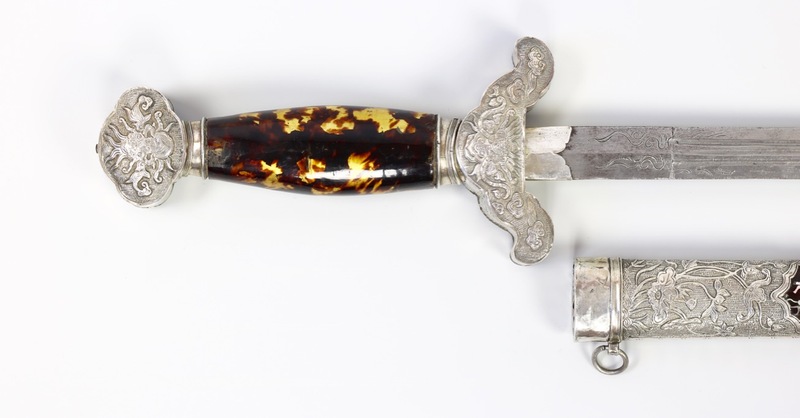 Its narrow but stiff blade with two grooves on each side and floral engravings near base and tip. It has a silver sleeve at the base of the blade. 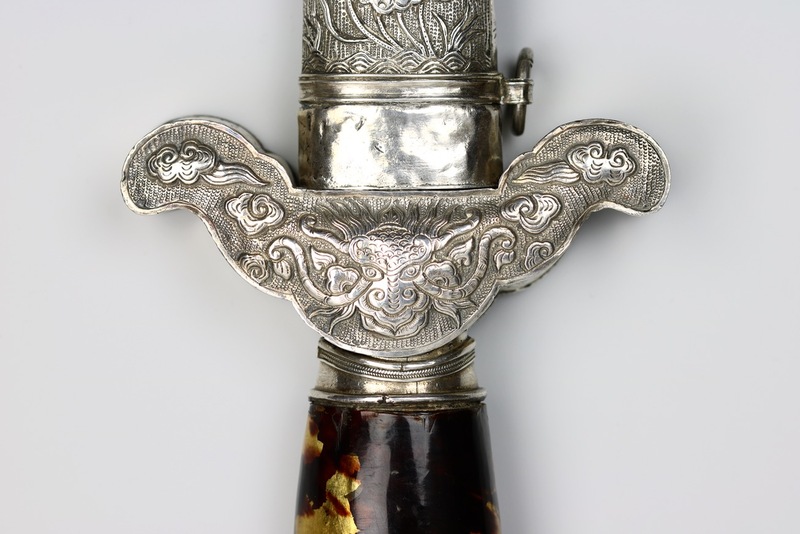 The sword is fitted in a set of silver fittings in repoussé, decorated with floral themes. The guard and pommel feature a very stylized kīrttimukha ("Face of Glory"). 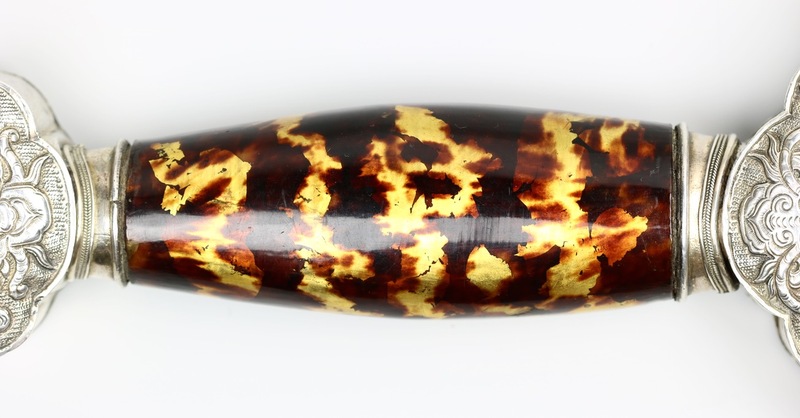 The handle is covered with gold foil and subsequently lacquered with a thick, highly transparent lacquer with brown spots imitating tortoise shell. 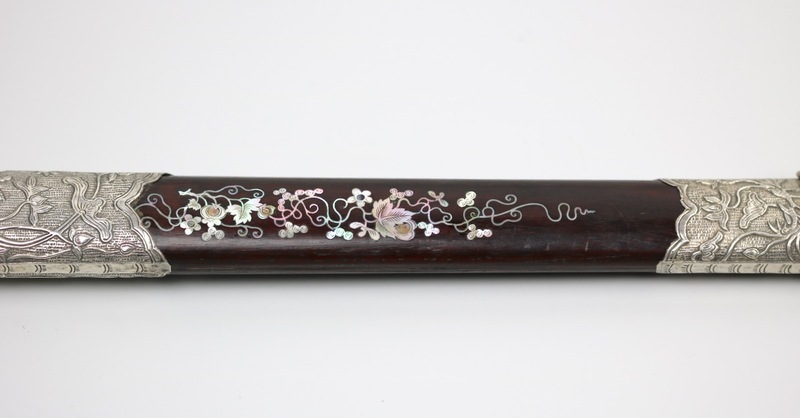 The dark hardwood scabbard is decorated with complex inlays in mother of pearl in the form of complex vines with thin, curling tendrils and various leaves, fruits and blossoms. The work also contains a few butterflies that symbolize long life, beauty and elegance. 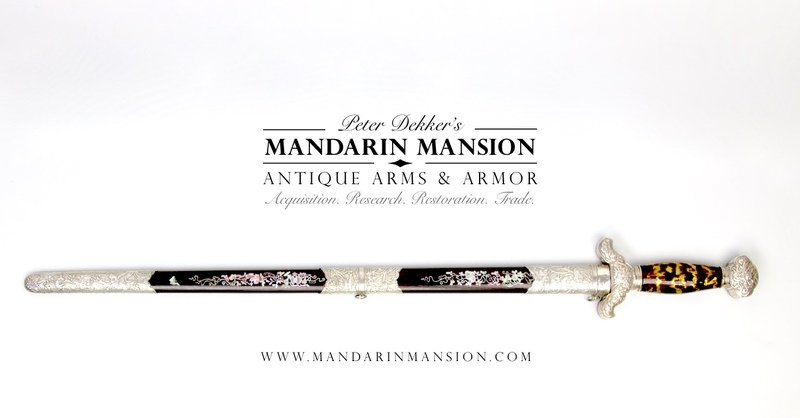 The work is of a very high quality, the craftsman showing off his skills by making some rather long and complex sections out of a single piece of mother of pearl. No losses to the delicate mother of pearl inlays. Blade in great original, untouched condition. Minor damage to the silver sleeve at the base of blade. Some minor dents in the silver fittings, otherwise in excellent condition throughout. 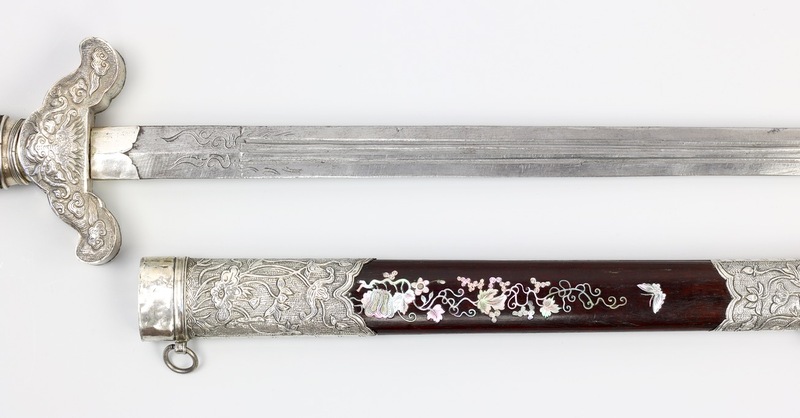 A very good example of a Vietnamese straightsword or kiem , in great condition. It has an interesting handle with lacquer over gold foil. The mother of pearl inlays are very well done, and there are no losses to this precious work.